His cousin held the man at gunpoint. Your son is staying up late, talking to strange people on the Internet. Wearing odd clothes. Using incomprehensible slang. Is this Reefer Madness? Maybe. Or perhaps your kid is just a brony. Your son is staying up late, talking to strange people on the Internet. Wearing odd clothes. Using incomprehensible slang. Is this Reefer Madness? Maybe. Or perhaps your kid is just a brony. What is a brony? Chances are you already know the basics, but for those who don’t, a brony is a young adult fan of the TV show My Little Pony: Friendship Is Magic. The name is a portmanteau of “bro” and “pony,” due to the fact that young men in their teens and early 20s make up a high proportion of the online fanbase. So how can I tell if my child is a brony? In theory, regular exposure to My Little Pony: Friendship Is Magic should promote love, tolerance, and a cheerful demeanor. In reality, it probably means spending a lot of time on Tumblr or on message boards like Ponychan. But isn’t My Little Pony meant for young girls? Technically, yes. The original TV show and toys were popular almost exclusively with the under-12 market, with a few outliers in the form of adult collectors—usually women. But as of 2010, the series reboot has drawn attention from a completely different demographic. Ironic or otherwise, there’s something about MLP that calls out to adult viewers. As well as being a gleefully uncynical show about universal themes such as, yes, friendship, there’s something truly counterculture about being a fan. The two poles of “acceptable” interests for teenage boys can be represented by videogames and sports, both of which can be interpreted as play-fighting. My Little Pony is the complete opposite of this, telling stories about tolerance and acceptance in a candy-coloured world full of cheerful cartoon animals. Really, it provides an entertainment alternative that is so utterly out-there it can’t be seen as anything but rebelling against the norm. Aside from its famously cult-like status, My Little Pony seems to hold an irresistible appeal to a certain type of geeky young guy. Just take a look at this episode of YouTube series Teens React, in which a group of teenagers are shown an episode of MLP: Friendship Is Magic and asked for their opinions. OK, I guess I can understand that. 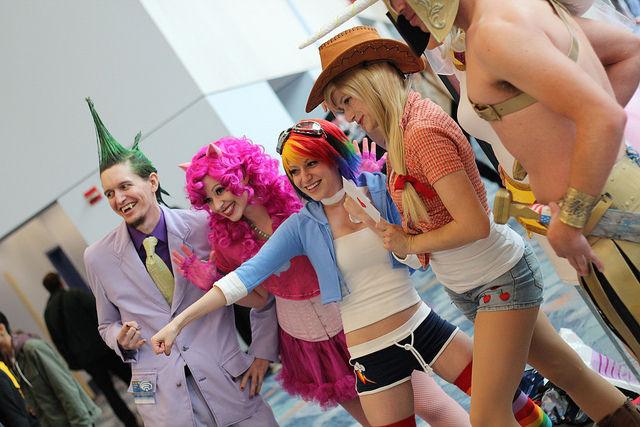 But isn’t it a little weird for grown men to dress up as ponies and go to conventions? No weirder than dressing up as a Klingon and going to a Star Trek convention. For years, young women have been attending fan events for traditionally “masculine” shows such as Transformers, but for some reason people see the reverse as being less socially acceptable. So much so that when one psychologist discovered that his son was a brony, he decided to research the topic in an academic study. The darker side of this unexpected gender divide is the resulting conflict between some male bronies and supporters of the show’s intended fanbase. Some fans point out that the adult-oriented or ironic aspects of brony culture run the risk of distracting from the originally cute and friendly atmosphere of the show. Also, the “brony pride” attitude of some male MLP fans has ended up creating a male-dominated environment around one of the very few positive TV shows aimed at young girls. Although the majority of bronies try to espouse the MLP virtues of friendship and tolerance, MLP fandom has seen its fair share of infighting. How can I find out more about brony fandom? Funny you should ask that, since on top of the understandably huge amount of press coverage awarded to the brony phenomenon, the bronies themselves recently released a documentary called Bronies: The Extremely Unexpected Adult Fans of My Little Pony. Running a full $262,000 over its original Kickstarter goal of $60,000, the documentary is a true testament to the enthusiasm of My Little Pony fandom, as well as the online clout of executive producer, brony and former Star Trek actor John de Lancie. But if you’re not up to watching an entire movie on the subject, you could take a less intense route and follow a MLP Twitter account such as @myponynews or the slightly mocking @FIMFiction_TXT, which reposts quotes from MLP fanfics. Equestria: The setting of MLP, a magical kingdom ruled by unicorn sisters Princess Celestia and Princess Luna. Equestria also lends its name to popular brony fandom hub Equestria Daily. “20% cooler”: This catchphrase originates from a line spoken by MLP character Rainbow Dash, and can be used either sarcastically or literally. Brohoof: The brony version of a fistbump. Ponify: Based off some of the verbal tics of MLP characters, ponifying is the act of making words sound like they were spoken by the ponies themselves. For example, “everybody” becomes “everypony.” There’s even a program you can download to ponify your browser.